Photo-contact dermatitis (PCD) describes the adverse cutaneous reaction that occurs in some patients as a result of simultaneous exposure to a contactant and to light. 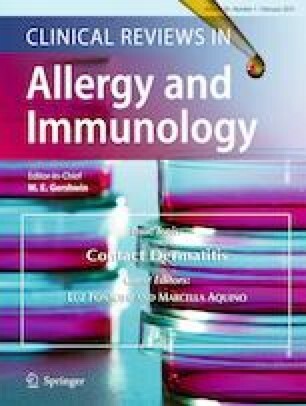 PCD can be subdivided into photo-allergic and photo-irritant dermatitis depending on whether the contactant respectively invokes an allergic or irritant reaction. Photo-irritant reactions are commonly caused by plants, psoralens, and medications taken internally, whereas photo-allergic reactions are commonly caused by sunscreens and topical nonsteroidal anti-inflammatory medications. The work-up of photo-contact dermatitis includes a thorough history and physical exam augmented by patch and/or photopatch testing, as the cornerstone of treatment for PCD is identification and avoidance of the irritating or allergenic chemical. Photo-contact dermatitis has the potential to significantly impact quality of life, so an informed approach to diagnosis and management is critical. Clinical mimics of PCD include polymorphic light eruption, solar urticaria, actinic prurigo, hydroa vacciniforme, cutaneous porphyrias, and systemic disorders with photosensitivity such as lupus and dermatomyositis. Herein, we review the clinical presentation, differential diagnosis (including the clinical mimics mentioned above), pathogenic mechanisms, diagnostic testing, and therapeutic considerations for PCD. Margaret Snyder, B.S.A. declares that she has no conflicts of interest. Jake E. Turrentine, M.D. is the Section Editor of the Self-Assessment Section of Dermatitis and serves on the Investment Committee for the American Contact Dermatitis Society. Ponciano D. Cruz, Jr., M.D. is the Editor-in-Chief of Dermatitis and is a consultant for Mary Kay Cosmetics, Inc.
Not applicable as there were no individual participants in this review.